Cabbage Dal Curry | Simple and Delicious ! Summer vacation is over, last week was so hectic with packing things, calling friends.. While getting up, only thought in mind was what to cook simply today,not in a good mood to try out any thing new, or to call grocery for things..I checked fridge and there were a piece of cabbage with a pale face and a capsicum waiting for their turn...I was afraid to leave it again thinking about the consequences if the DH finds it there..Yeah, this lazy soul takes veggies from the fridge because of two reasons, first one is blogging and next is because of the fear of checking.. :) Again after searching kitchen, found some masoor dal there, so thought about the birth of a cabbage dal curry, which should be a simple one for my readers..
Cook dal with chopped onion, tomato, turmeric powder and salt in enough water. Heat oil in a kadai, allow mustard seeds and cumin seeds to splutter. Add chopped garlic and fry until it turns brown. Then add ginger, curry leaves and slit green chillies. Saute them for a while, until aroma of ginger comes out. Add cabbage and capsicum with salt and chilly powder. Stir and cook without adding water. Water needed for cooking will come out from the cabbage. when it is cooked well, mix it with the cooked dal mixture. When this start to boil, remove from fire. 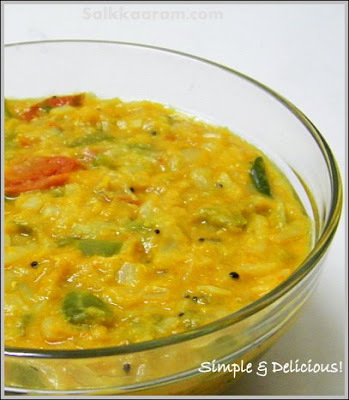 Cabbage dal looks delicious..never used coconut oil in making dal!!! m sure must have tasted yum yum!! Ha you gave birth to a new type of dal...that's awesome and I am sure it might have tasted awesome..nice idea to add cabbage to dal.. Thanks for dropping by to say hello. :D It's been a while since I came here. Your blog has a nice new look! Why packing? Going somewhere? Dhal looks very nutritious and healthy... We sometime use Channa dhal too!!! nice color too!!! 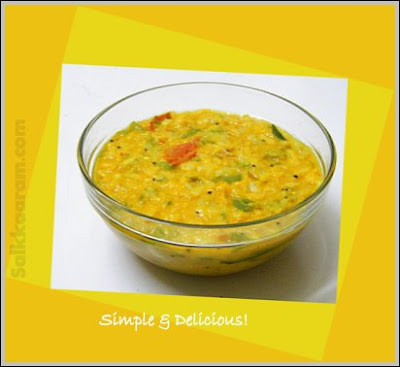 Seena, dal and veggies combination is always very comforting and yet delcious. Lovely clicks! Cabbage n dal sound like a great combo! OMG! This looks super yummy. THANK YOU!!!! Looks so delicious & colorful . Its a great combo . A new dish! !looks delicious..will try it out..
Never had this combo before. Looks very yummy and delicious! Oh you have changed the look...its great!..and a lovely dal no doubt..we often make this too..though I dont' remember it looking as pretty as this! Have you ever tried adding a little ground coconut and jeera paste to this? I usually make this with green gram dal. Will try to use masoor dal the way you did and see for myself. How are you? Long time and no news?